great wind power fraud with real precision. As time goes by, the number of crack energy market experts joining the effort to bring the great wind power fraud to its inevitable denouement – and the quality of their work directed at that fine and noble task – has increased exponentially. The American “Institute for Energy Research” has just released a brilliant piece of analysis (pdf available here) that tips an enormous bucket on each and every one of the vacuous claims made by the wind industry, its parasites and spruikers about the “merits” of wind power. We’ve picked the eyes out of the (very substantial) paper and summarised its key points below – but we recommend you take time to digest the whole study for the range of topics covered, its attention to detail and carefully crafted arguments – all thoroughly supported and well referenced. The study also includes a solid section on the adverse effects of wind turbines on human health, the slaughter of millions of birds and bats and the toxic mountains of sludge generated during the manufacture of turbines, which we haven’t included in our summary below – providing another good reason to read the whole study. The study has direct application to the wind industry rort in Australia: just substitute “Canberra” for “Washington”; the “Clean Energy Council” for the “American Wind Energy Association (AWEA)”; and substitute “Large-Scale Renewable Energy Target (LRET) and Renewable Energy Certificate (REC)” for “Renewable Portfolio Standards (RPS) and the Production Tax Credit (PTC)”. The federal wind Production Tax Credit (PTC) is a substantial subsidy that has provided the wind industry billions of taxpayer dollars and is working to harm reliable, affordable sources of electricity generation such as natural gas, coal, and nuclear power. The PTC was first enacted in 1992 as a temporary measure to bolster the wind industry. From 1992 through today, it has been extended seven times. In its current form, the PTC provides owners of wind facilities a subsidy of $23 per megawatt-hour of electricity generated for the facility’s first 10 years of operation. The PTC technically expired at the end of calendar year 2013, but new facilities will still qualify through 2015 under new, expanded conditions. A new two-year extension, as is contemplated in a bill passed by the Senate Finance Committee, would cost American taxpayers more than $13 billion. For context, that amounts to 4.8 million families’ entire federal tax bill in a single year – or enough to buy the entire Mongolian economy and still have more than a billion dollars left over. In sum, the PTC is one of the most egregious subsidies that the federal government provides. The wind industry in the U.S. benefits from many federal programs intended to make wind-generated electricity competitive with other sources. Chief among these federal programs is the wind Production Tax Credit (PTC). The PTC was first enacted in 1992 and has since been extended seven times. In its current form, the PTC provides owners of wind facilities a subsidy of $23 per megawatt-hour of electricity generated for the facility’s first 10 years of operation. To put the size of the subsidy in perspective, prices in wholesale electricity markets typically hover around $50 per megawatt-hour. Most recently, the PTC was extended in January 2013 and expired at the end of that year. In the last extension bill, however, Congress expanded the qualification criteria to include facilities that had commenced construction by the end of 2013 instead of requiring that facilities be complete. The change in language enabled the Internal Revenue Service (IRS) to expand eligibility to projects that had not initiated physical construction but had merely secured financing, including many facilities that began or will begin operation between January 1, 2014 and January 1, 2016. As a result, taxpayers will be on the hook for PTC payments through the year 2025. In April 2014, the Senate Finance Committee approved an $85 billion extension of roughly 60 expired tax provisions commonly referred to as “tax extenders.” The bill includes a two-year extension of the PTC — a retroactive extension for 2014 and a new extension through 2015. The PTC extension in the Senate bill would cost American taxpayers more than $13 billion over the next ten years. The House has taken a piecemeal approach to the expiring tax provisions and has not put forward an extension of the PTC. During the current lame-duck session to close out the 113th Congress, passing a tax extenderspackage will be a top priority. In a final push to include the PTC in the coming tax legislation, wind industry lobbyists such as the American Wind Energy Association (AWEA) will likely repeat a variety of well-worn arguments about why the PTC should be extended for the eighth time. The PTC was never intended to be permanent, and even AWEA has recognized that the PTC should end soon. If Congress chooses not to extend the PTC during the lame-duck session, the result will be a gradual 10-year phase-out of PTC payments, and new eligibility for the PTC will likely remain closed after 2015. The Senate Finance Committee estimates that a two-year extension of the wind PTC would constitute a tax expenditure of $13.35 billion, an enormous implicit transfer from the general taxpayers to the wind industry and its financial partners over ten years. For scale, that’s enough to pay 124 million Americans’ average monthly electricity bill for a whole month. Alternatively, this is the same as the total tax bill of 4.8 million families with median incomes for a single year. Supporters of the wind PTC argue that new wind turbines are the cheapest way to generate electricity and to replace the rapidly retiring fleet of coal-fired power plants. However, adding wind power to the grid raises the total cost of delivering electricity in two important ways. First, wind is a more expensive source of electricity than new natural gas-fired power plants, or existing coal plants, nuclear facilities, and hydroelectric plants. Second, the unreliable nature of wind power imposes new costs on the grid and hurts current sources of electricity generation. PTC advocates often cite the levelized cost of energy (LCOE) to argue that wind energy is cheaper than alternatives. LCOE is an estimate of the cost of electricity from new electricity generators produced by both the Energy Information Administration (EIA) and the National Renewable Energy Laboratory (NREL). This method, however, fails to measure the true cost of wind energy on the grid for three main reasons: 1) Comparing the levelized cost of electricity from natural gas, coal, or nuclear to wind is an apples to oranges comparison, 2) LCOE ignores the low cost of existing sources of generation, and 3) the LCOE for wind power is based on unrealistic assumptions. Since load must be balanced on a continuous basis, units whose output can be varied to follow demand (dispatchable technologies) generally have more value to a system than less flexible units (non-dispatchable technologies), or those whose operation is tied to the availability of an intermittent resource. The LCOE values for dispatchable and non-dispatchable technologies are listed separately in the tables, because caution should be used when comparing them to one another. Despite EIA’s words of caution about directly comparing reliable sources and intermittent sources, frequently people make the comparison. The way to make an apples to apples comparison between wind and natural gas, coal, or nuclear would be to include the cost of backup power with other wind costs to make a valid direct comparison. 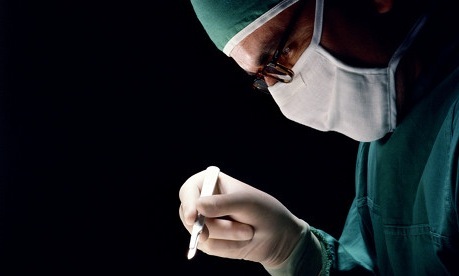 To the second point, most levelized cost calculations focus on the costs of new generation. It does not provide a useful comparison of the cost of existing coal, gas, and nuclear plants against wind power. Even if the EIA’s estimate of wind power’s LCOE — around $80 per MWh — is assumed to be accurate, wind cannot supply electricity as cheaply as current wholesale electricity prices, which hover around $50 per MWh. These low wholesale prices reflect the low cost of providing electricity using the existing infrastructure of natural gas, coal, and nuclear plants. A study by George Taylor and Tom Tanton found that, when factoring in a 20-year lifespan for wind turbines and a lack of subsidies, wind power costs $101 per MWh. When backup generation is accounted for, the cost goes up to $149-$153. Levelized cost estimates don’t incorporate the full costs of long-distance transmission associated with wind power. Because high-quality wind resources are often located far away from places where people use electricity, wind power is more expensive to transmit than conventional sources that can be sited closer to demand. The costly transmission investments needed to bring wind power to the grid factor into electricity rates and frequently translate into higher rates for customers. According to Berkeley Labs researchers, transmission expenses range from $0 to $79 per MWh — the median cost being around $15 per MWh. One example of the high cost of new transmission projects is the Competitive Renewable Energy Zone in Texas (CREZ). This electricity transmission project linked the large wind facilities in west Texas to the population centers in east Texas. The CREZ project cost nearly $7 billion. Lastly, the cost of building new wind facilities and new transmission lines to get the electricity from the windy areas to the population centers of the United States also creates additional costs because total U.S. electricity generation has not increased in nearly 10 years. This lack of an increase in electricity generation means that adding new sources to the generation system is duplicative in many cases. In Germany, despite more than two decades of subsidies, solar and wind power only accounted for 11 percent of overall electricity generation in 2011. As the German government began pursuing aggressive green energy targets by closing reliable power plants, electricity costs dramatically increased. The levelized cost of electricity focuses on each source of electricity on its own (one at a time). As such, it fails to reflect the costs that wind imposes on other components of the power grid, including other sources of generation. In addition to the long distance between the best wind resources and population centers, the inherent variability and unpredictability of wind power necessitates additional (backup) generation resources. We can see how adding more and more wind power to the energy mix has played out in the real world. Electricity prices are high and rising in countries that have aggressive policies subsidizing wind, like Germany, Spain, and Canada. It’s the same story in many of the largest wind-producing states in the U.S.
Average electricity prices for companies have jumped 60% over the past five years because of costs passed along as part of government subsidies of renewable energy producers. Prices are now more than double those in the U.S.
Due to theses price increases, as many as 800,000 citizens have been unable to pay their electricity bills and have had their power cut off. The situation has gotten so out of hand that the International Energy Agency (IEA) has warned of consumer backlash if the government fails to contain energy costs. Also, German industries such as BASF are curtailing investments in Germany as a result of the country’s energy policies. In the U.S., many states that have seen the greatest increases in wind power have also seen prices rise. In fact, with the exception of Oklahoma, every one of the top ten wind power states has had electricity prices increase by at least 14 percent. Given that this rise is five times faster than the national average, it is a trend that cannot be ignored by policymakers. 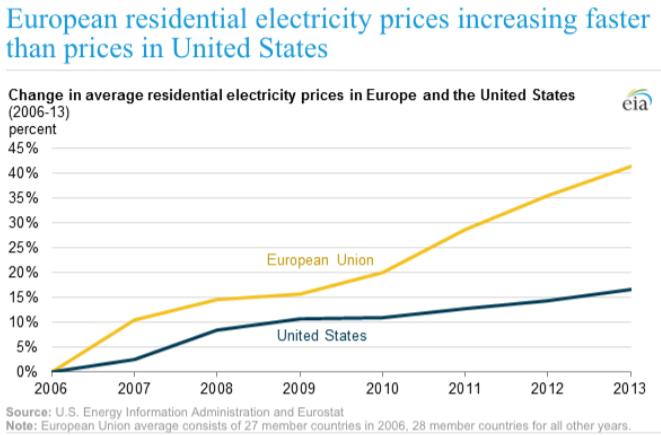 The chart below from the U.S. EIA highlights the rapidly increasing electricity prices in Europe as compared to the U.S. The EIA explains that regulatory structures, taxes, and investment in renewable energy technologies influence electricity price. In Spain, a program to subsidize renewable energy began in 2000 and was expanded in 2008. One consequence of these policies has been a large increase in rates — electricity prices have risen by more than 90 percent in the last 6 years. A similar story has unfolded in Canada, where government-subsidized wind power provides just under 4 percent of Ontario’s power, but accounts for about 20 percent of the cost of electricity. In the U.S., many states that have seen the greatest increases in wind power have also seen prices rise. In fact, with the exception of Oklahoma, every one of the top ten wind power states has had electricity prices increase by at least 14 percent. Given that this rise is five times faster than the national average, it is a trend that cannot be ignored by policymakers. Simply put, the framework used by wind PTC proponents to demonstrate the “low” price of wind power does not reflect reality. While we can see how wind power increases electricity prices, perhaps more concerning are its effects on grid reliability. Subsidizing wind power on a per-megawatt basis threatens the reliability of our electric grid. The stability of the U.S. power system depends on the ability of electricity suppliers to match demand second by second, every day. Because wind power depends on the weather (and there is still no cost-effective way to store electricity for times when the wind isn’t blowing), wind energy is not capable of continuously meeting demand. Wind power also tends to be more available at night, when demand is low. Despite the low value of electricity overnight, the PTC gives wind developers the same tax credit to produce electricity at night as it does to produce it during times when electricity is the most valuable. This means that wind generators are not concerned about trying to produce electricity when demand is high and electricity is available, but rather to produce as much electricity as possible whenever the wind is blowing regardless of whether the electricity is needed or not. The unreliable nature of wind power, fueled by the PTC, threatens the reliability of our electric grid because it makes it more difficult to balance supply and demand. The PTC also makes affordable and reliable electricity sources less economical by allowing wind producers to pay utilities to take their power. Wind production tends to peak in the spring and the fall, when the need for energy is at its lowest, and it decreases in the winter and summer when heating and cooling needs drive up electricity use. The same problem occurs on a day-to-day basis: more wind energy is produced at night, when power demand is down, than during peak hours during the day. This directly threatens grid reliability: at times when demand for power is low, the grid is flooded with excess of wind generated power which forces base load plants running on coal and natural gas to operate at inefficient levels. Plants running at these inefficient levels produce far more CO2 emissions than they normally do, which offsets much of the reduction in CO2 emissions to which wind power might lead. A 2011 report from BENTEK Energy revealed that any decreases in CO2 levels resulting from wind power were negligible in size or economically impractical. In order to supply electricity when people demand it, some power plants have to be ready to quickly increase and decrease production to match consumer demand in real time. To accomplish this feat, different plants provide varying amounts of power at different times of the day. Wind power does not fill any of the roles below because it is not “dispatchable” (a grid operator cannot “turn on” a wind facility because its output depends entirely on weather conditions). Baseload plants are those which provide consistent power in an efficient and cost-effective manner, handling electricity demand at all times of the day or night. These plants are usually coal-fired or nuclear-powered. Intermediate load plants, such as combined cycle natural gas facilities, can ramp up and down in a relatively efficient way depending on electricity demand, but they are most efficient when they operate for extended periods. Peak load plants, which are usually simple cycle natural gas or oil-burning plants, are even more flexible and can increase or decrease output very quickly, but they operate less efficiently than baseload or intermediate generators. Wind power only produces electricity when the wind is blowing, so these other sources of electricity have to back it up to satisfy demand. When demand is low and winds are high, reliable power plants are sometimes forced to back off, as wind turbines generate unneeded power. It is inefficient for any plant to ramp up and down more than is needed to meet demand. Instead of helping utilities match supply and demand, wind makes it more difficult to operate the grid reliably. The question isn’t whether the PTC “creates jobs” — it’s whether it creates more jobs than it takes away from the rest of the economy. The wind PTC does not create jobs on net, compared to an alternative policy in which the federal government refrains from using the tax code to pick winners and losers. Although the American Wind Energy Association claims that failing to reauthorize the tax credit would “kill jobs,” the money used to subsidize those jobs comes from taxpayers, not from thin air. In Spain, for example, where the government pushed “green energy subsidies” aggressively, 2.2 jobs were lost for every “green job” that the subsidies supported. For the reasons above, it is completely disingenuous for AWEA to sell the PTC as a job creator. Although wind energy suffered severe growing pains and struggled through a stormy adolescence during the 1980s, it has matured. Wind energy is now ready to take its place alongside fossil and nuclear fuels as a conventional source of electricity. Gipe is not alone in arguing that the wind industry is mature. Senator Chuck Grassley, the original author of the PTC, stated in 2003 that “we’re going to have to [subsidize wind] for at least another five years, maybe for 10 years. Sometime we’re going to reach that point where it’s competitive.” Senator Grassley’s statement was eleven years after the PTC was enacted. Now, eleven years after that, the Senate is grappling over Grassley’s recent addition of a two-year extension of the PTC to a broader tax extenders package. According to data from the BP Statistical Review of World Energy 2014, installed wind turbine capacity increased 3,705 percent from 1997 to 2013, jumping from 1,611 MW to 61,292 MW. If the wind industry was mature before it saw such rapid growth, why does it still need the PTC now? The “infant industry” rationale for supporting wind power thus has little basis in reality. If AWEA is correct when it says, “Wind power in good wind resource areas is now very cost-competitive with any other new generating plant,” then there is no need to continue propping up the wind industry with taxpayer subsidies. If AWEA is wrong, and the wind industry still isn’t competitive after twenty-two years of heavy subsidies, then the PTC amounts to a failed experiment and a waste of taxpayer funds. The Energy Information Administration conducted a renewable energy subsidy analysis for FY2007 to FY2011 and found that federal support for renewables increased by 108 percent. This increase was mainly because of the passage of the American Recovery and Reinvestment Act (ARRA) of 2009, which was meant to “stimulate” the economy during the worst part of the recession. Specifically, the amount of federal subsidy money available to the wind industry skyrocketed to $4.99 billion. Rather than replace other federal and state subsidies for wind power, this surge in the amount of federal financing available merely added to the total. Much of the ARRA stimulus money for wind came from the Treasury through Section 1603 of the law. The Section 1603 program provided grants equal to 30 per cent of the cost of a renewable energy project to developers. The program expired on December 31, 2011. Today, no new projects can take advantage of this subsidy, but projects that were initiated before 2011 can still garner funding from this program, if the project is completed by December 31, 2016. In FY 2010, wind was subsidized more heavily per unit of energy production than coal, natural gas, nuclear power, geothermal, and hydropower. Only solar energy received more subsidies than wind. In FY 2010, wind received $52.68 per MWh. Despite generating the majority of U.S. electricity for that year, coal only received $0.64 per MWh, and natural gas and petroleum liquids received only $0.63 per MWh. That is, because wind power relies on backup electricity from coal-fired or natural gas-fired plants when the wind isn’t blowing, we have to take into account CO2 emissions from the backup generation. The Civitas study reveals that CO2 emissions from these plants are especially high when used in a backup capacity — combined cycle natural gas plants operating without wind on the grid would emit less CO2. We can do better. We shouldn’t pursue an energy strategy that subsidizes unreliable sources of power while simultaneously cracking down on reliable sources with new regulations from the EPA. It is well past time for Washington to take the training wheels off of the wind industry and let it chart its own course. The federal wind production tax credit has propped up the wind industry for 22 years — on top of dozens of other federal and state policies designed to support wind — yet industry lobbyists claim it still needs help. Two decades after the PTC was first enacted, wind-generated electricity comprises less than 5 percent of our total supply. At the same time, wind power has contributed little to the environmental and energy security goals it was meant to address. Unfortunately, the PTC is a very effective way to accomplish at least one thing: wasting American taxpayers’ money. We can do better. We shouldn’t pursue an energy strategy that subsidizes unreliable sources of power while simultaneously cracking down on reliable sources with new regulations from the EPA. Wind energy can’t deliver reliable power because, even after two decades of a tax credit, it still relies on random weather patterns to generate electricity. Subsidizing today’s wind industry does nothing to solve wind power’s fundamental reliability problem. Furthermore, far from being a “job creator,” the PTC is a net jobs loser. Even if the industry does add some jobs to the economy, those jobs come at the expense of other jobs in industries that would create new value for customers. We should not follow the example of Spain, where 2.2 jobs were lost for every “green job” created. The PTC cannot be justified on environmental grounds, either. The U.S. is already outpacing the rest of the world in terms of CO2 reductions, largely because of innovations in natural gas rather than because of wind power. Wind turbines also kill a staggering amount of protected birds and bats and have negative health effects on nearby residents. The costs of the PTC overwhelmingly outweigh the benefits. Lawmakers should prioritize American households over wind industry lobbyists. The cost of the PTC to American taxpayers – at a mere US$23 (currently AUD$27.65) per MWh – is a modest snip compared to the expected cost to all Australian power consumers of its Australian equivalent – the Renewable Energy Certificate (the “REC” aka the “LGC”). While RECs are currently trading at $32, from 2017 – when the annual figure for the LRET starts to increase dramatically – RECs will be worth at least as much as the mandated shortfall charge of $65 per MWh. The total renewable energy target between 2014 and 2031 is 603,100 GWh, which converts to 603.1 million MWh (1 GW = 1,000 MW). In order for the target to be met, 603.1 million RECs have be purchased and surrendered over the next 17 years: 1 REC is issued for every MWh of renewable energy dispatched to the grid. The REC is a Federal Tax on all Australian electricity consumers. “[T]he subsidy is the REC, and the REC certificate is acquitted at the retail level and is included in the retail price of electricity”. It’s power consumers that get lumped with the “retail price of electricity” and, therefore, the cost of the REC subsidy to wind power outfits. Even at the current REC price of $32, the amount to be added to power consumers’ bills will hit $18 billion. However, beyond 2017 (when the annual LRET target ratchets up from 27.2 million MWh to 41 million MWh and the $65 per MWh shortfall charge starts to bite) the REC price will almost certainly reach $65 and, due to the tax benefit attached to purchasing RECs, is likely to exceed $90. Between 2014 and 2031, with a REC price of $65, the cost of the REC Tax to power consumers (and the value of the subsidy to wind power outfits) will approach $40 billion – with RECs at $90, the cost of the REC Tax/Subsidy balloons to over $54 billion (see our post here). This massive stream of subsidies for wind power is the greatest wealth transfer in the history of the Commonwealth; and stands as a regressive tax/subsidy grab by stealth, which hits the poorest and most vulnerable; struggling businesses; energy intensive industries; and cash-strapped families the hardest – with absolutely NO measurable economic or environmental benefit in return. The insane and pointless costs of the mandatory LRET are little more than a form of economic and social self-flagellation. The LRET (like the PTC) is simply unsustainable. Any policy that is unsustainable will either fail under its own steam; or its creators will eventually be forced to scrap it. STT hears that Tony Abbott is acutely aware that the mandatory LRET is an entirely flawed piece of public policy; and is nothing more than an out of control industry subsidy scheme. As such, it represents a ticking political time-bomb for a government that doesn’t need anymore grief from an angry proletariat. And boy, the proletariat are going to be angry when they find out that under the mandatory LRET they’re being lined up to pay $50 billion in REC Tax – to be transferred as a direct subsidy to wind power outfits and added to their power bills – over the next 17 years. For Tony Abbott to have any hope of a second term in government, the mandatory LRET must go now. Tony, keen for another lap around the block? Then the mandatory LRET must go: NOW. Nuclear breeder reactors are the only way to shut down ALL fossil carbon burning. There are two good designs. The Integral Fast Reactor, and the Liquid Fluoride Thorium Reactor. Both are meltdown immune, consume tiny amounts of fuel, and produce short-lived waste at a rate of less than a ton per thousand megawatt-years. Tony, the LRET must go now, not later, now, no ifs or buts. Its time that Tony Abbott ditched his ‘spin’ masters and started telling things as they are. He knows damn well what a rort ‘wind farms’ are but has been nobbled into silence. The occasional ‘foot in mouth’ comment from Abbott won’t lose him any voters. He also needs to explain why the RET must go — hardly a difficult task for a Rhode scholar.